While much has been written about rural migrant workers’ experiences in the big cities, population movements into China’s vast network of towns and small cities has been largely neglected. 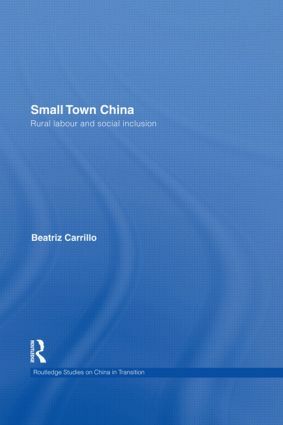 This book presents a detailed case study of rural migrant workers experiences in a small town in a north China county. The author explores the processes and institutions that enable or preclude the social inclusion of rural workers into the town’s socio-economic system. Inclusion and exclusion are assessed through an examination of rural workers’ immersion into the urban labour market, their access to welfare benefits and to social services, such as housing, education and health. The book proposes that outside the larger cities there are alternative accounts of urban social change and of the integration of rural migrant workers. It stresses the fact that the particular socio-economic structure of towns, where the state-owned share of the economy has been smaller and where consequently social and private forces have been more active, allowed for a more open inclusion of rural workers. Though shortcomings are still observed, the book suggests that China's transformation may not necessarily result in dysfunctional and socially polarized urban environments. This book will be of interest to students and scholars of China’s rural migrant workers, bottom-up urbanization and small town development, social policy, and more broadly on contemporary social change in China.